She is widely sought after, popular and skillful. Moi Mee makes sure every aspect of your bridal needs is taken care of; from hair to toe nails. It's interesting how she makes the effort to establish communication with her clients online and describe her work in detail. Providing service out of Ipoh, she covers other towns in Perak as well. Her website is an Label:online store for you to shop products like handmade Label:accessories, nail tips, Label:dresses, tops and Label:shoes. Brides have been really impressed with her craft and pro-active personality. She is not a girl that sits around, waits for things to happen, see how it goes. She takes the extra mile to promote her service and talk over the requirements of her customers before taking any action. "I had my ROM make up with MoiMee just during the Chinese New Year. To be frank, I was surprised she is a punctual person and even making a morning call for me to wake up for preparation. You know, mostly we go to bed very late during Chinese New Year celebration. She is a sweet and touching lady on doing this. 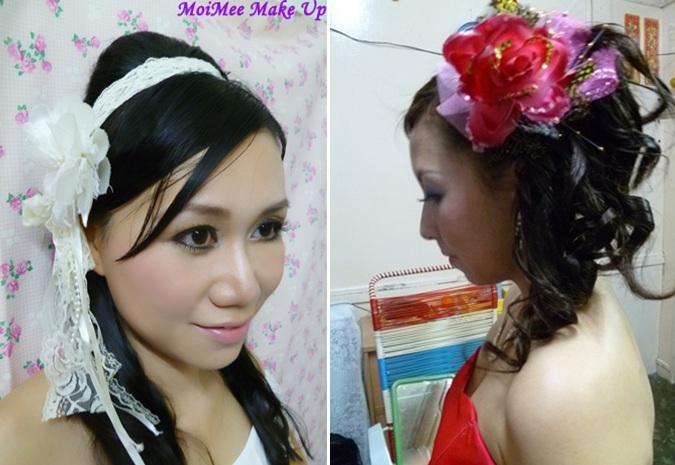 About her make up...I could say I am very satisfied and of course she is a really professional make-up artist. I have no doubt at all. My hubby likes my ROM make-up & styling image too. She also helped out my hubby on the eyebrow trimming as FREE gift." "Moimee is quite a good & professional makeup artist. My sister married on last September and she is well done and making my sister hairstyle (both up do & down do for morning + dinner) very beautiful & elegant." "Until almost few week times before my actual day, MoiMee sent me some gentle reminders regarding my bridal hair accessories and the nails tips fabrication. Friendly speaking I do not really own such kind of accessories and even seldom having makeup session. 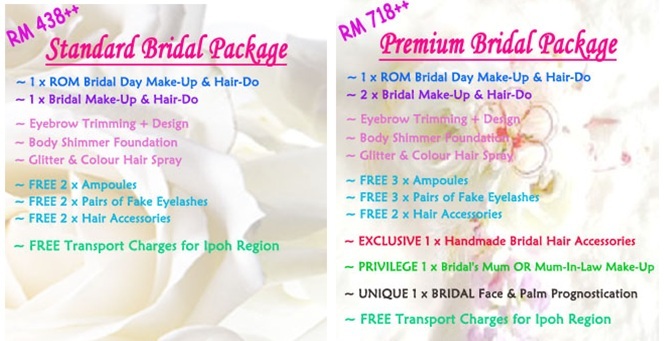 Of course since these are bundle on my bridal makeup package, considered as free gifts, why not I take it and perhaps she could really making me looks much prettier and enchanting on my big day? Then I do share her about my gowns pictures (in fact just share her also my pre-wedding photo) as per request. 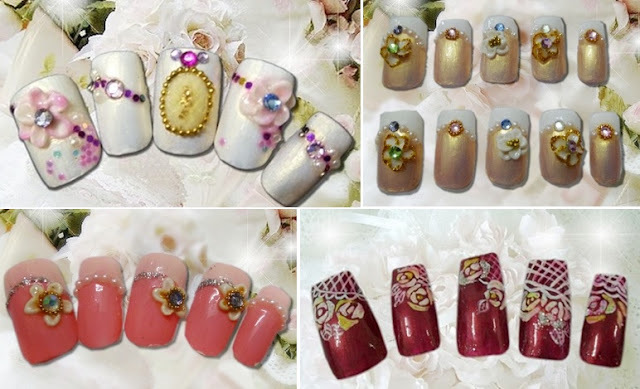 Furthermore all other info like color design and matching, wedding theme, stylish, preferable pattern design or art work on nails tips, I just have no idea and let her fully design for myself. And finally I really got splendid accessories. Many times more than what I expected. It is fabulous! I met MoiMee 1st time on my AD morning. She is a nice girl, gentle, helpful, polite, patient and has high toleration. MoiMee did have warm ‘alarm call’ and we started makeup session after my light breakfast. The whole session is very harmony and cheerful. For me, I appreciated her a lot for helping me on the make-up and hair-do in a rush condition (I can’t really imagine I have too many things to get ready here and there on my AD ceremony) Fortunately both of my makeup sessions ran smoothly and I did receive a lot of compliments from my wedding guests. My close friends since school time are giving so much great comments on my outstanding look, pretty, stylish & elegant makeup and hair-do. With no doubt, I am the brilliant bridal being the focus on my big day. Sweat and happy memory all recorded in my mind." Interesting rate for Ipoh area. Anyone know the price is still valid or not? I will call to ask for more infomation.